Logicbroker offers full business intelligence (BI) reporting for all data on our platform. We provide full access to our data set hosted independently in our reporting server, allowing you to create any kind of custom reports including bar, line, area, pie, donut, maps, gauges, tables etc. To access our advanced reporting navigate to Reports > Analytics. If you are looking to access our BI platform please contact us. Default report visuals are provided to give you a view of both your company and your partner's performance. By default there are 3 dashboard views that you can use as a template or edit. All reports are interactive and if an item or parameter is clicked the entire page will update the filter. For Example, if you click your partner's name in a chart the report page will update filtering data only related to that partner. There are also filter drop downs for partners and dates provided as well. On all visuals you can view the data behind the chart. If you hover over a chart and select the three dots on the top right of the chart then click Show Data; you will be brought to the table that makes up the visual. This data can also be exported to CSV/XLSX. 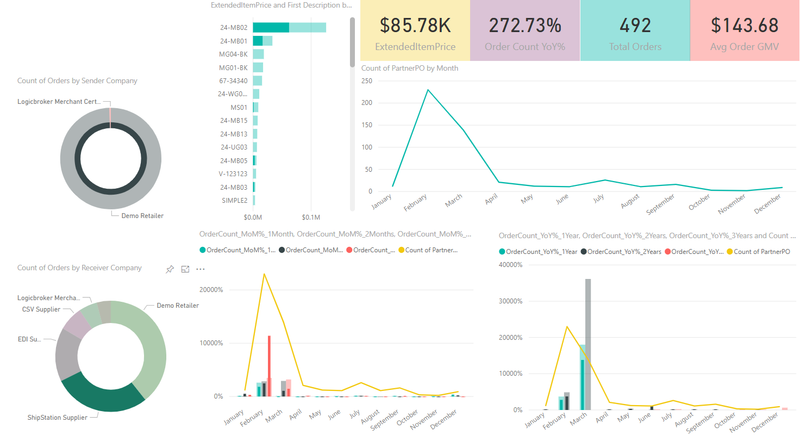 The Overview page provides a view on how you are performing, showing your partner order countdistribution, best performing products, and YoY% + MoM% changes. The Partner Dashboard will show more details for your specific partners. You can select a specific partner to view their individual performance or view all as an aggregate; in addition you can filter the report data by date. The data here includes sales and gross profit metrics for you partners. This shows how long it takes to receive a shipment per each line ordered. This does not take into account non-shipped items. Percentage of shipments that match against the original order sent to the supplier. This is the percentage out of all item quantities on orders that have been cancelled. This is the percentage out of all item quantities on orders that have been marked as backordered. This is the percentage out of all item quantities on orders that have been invoiced. If this number is low, that means orders aren't being invoiced and suppliers are leaving them open or cancelling them. This is the percentage out of all item quantities on orders that have been shipped. If this number is low, that means orders aren't being shipped and suppliers are leaving them open or cancelling them. Indicates the average percentage of items that have a quantity > 0. Total unique items available for the filtered partner. Number of items that have inventory updated per day. A running total for all days inventory was not updated. Each day no inventory was supplier will add 1 to this count. These are just default examples to show what data is available. Contact us to learn more about other metrics. If you are creating or editing your existing report you will see 2 navigation sections - Visualizations and Fields. The visualizations section allows you to select what visual or chart you would like to create. Select an icon and it will add to your canvas and will wait for you to add values. If you look at the Fields you can see a list of tables with fields for each table. 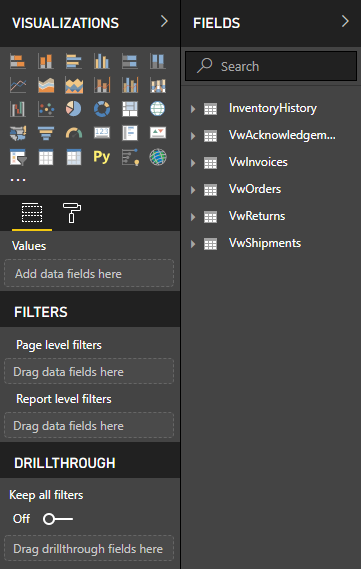 If you drag and drop the field into your visual or in the values section under Visualizations, it will automatically display your data in the canvas. You can select how your data is displayed by summarizing it based on count, sum, average, etc. 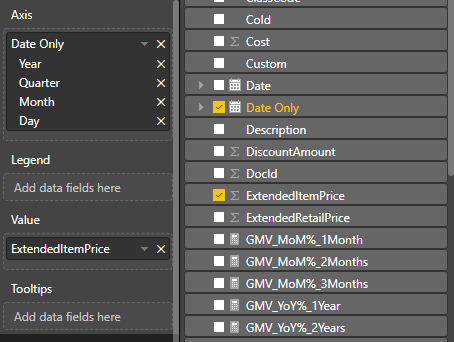 The data set provided is centered around your orders, meaning that all data aside from Inventory is linked to the order table. All Acknowledgements, Shipments, Invoices, and Returns are linked to the original order allowing you to calculate percentage shipped, matching ship method from order, etc. 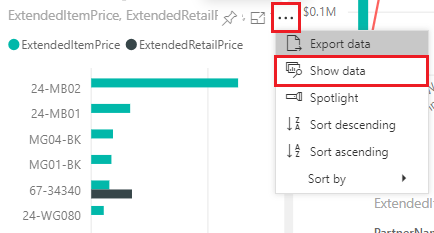 When moving data into a visual and the values include information from both Orders and another document type, the visual will only show the information that links to the order; this includes on the line level, matching the SupplierSKU as well. 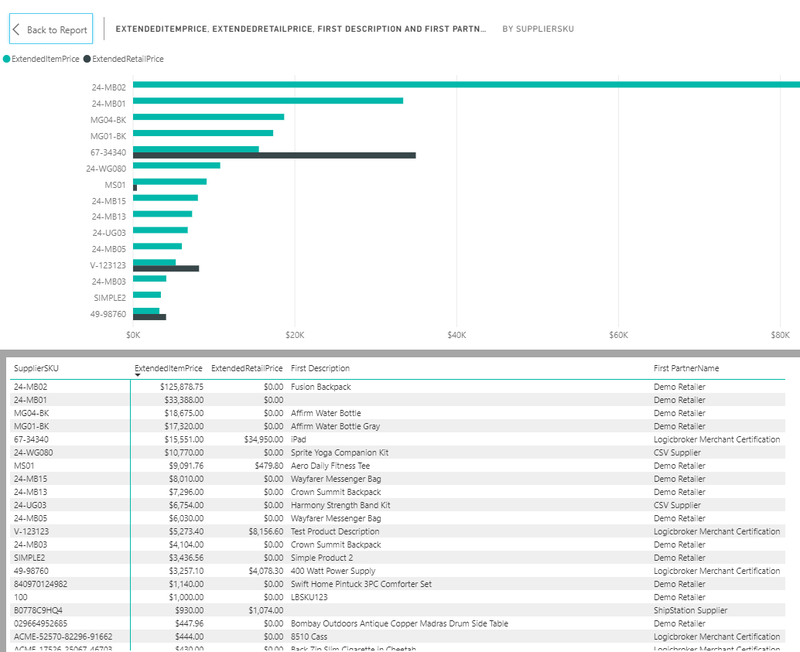 The report interface is built using Microsoft's Power BI, to learn more about editing and creating reports inside Power BI see this article. Logicbroker allows users to bring their data locally connecting it to other sources for further analysis. To do this you will be provided access to our Microsoft Power BI server allowing you to bring the data locally. Contact us for more information.